Whether you&apos;re visiting for a day or a month, each day in Wimberley reveals new adventures. Ideally situated at the convergence of the Blanco River and Cypress Creek, Wimberley Valley&apos;s natural beauty reveals itself in dramatic vistas and awe-inspiring panoramas. 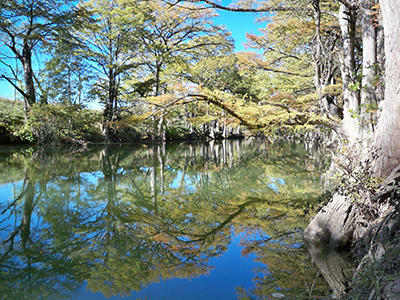 Blue Hole and Jacob&apos;s Well have achieved worldwide prominence as two of the most picturesque swimming holes in the great state of Texas. Hiking, biking, birding and geocaching are some of the many outdoor activities available. Wimberley&apos;s eclectic community adds another layer of appeal. Artists and musicians have made the area home for generations and this small town plays host to big-city arts and cultural activities, and world-class artists and artisans. Charming events fill Wimberley&apos;s calendar all year long. Arts Fest, the Butterfly Festival, live theatre, musical performances and more can all be experienced throughout the year. Shopping in Wimberley is a big draw for tourists. Held the first Saturday of each month from March through December, Market Day attracts shoppers and vendors from throughout Texas. The shops, galleries and boutiques that are open year round also offer a wealth of opportunity for browsing, buying and people watching. Shopping can be thirsty work and the Wimberley Valley has become a mecca for wineries, breweries and distilleries. Most have tasting rooms open to the public year round. Wimberley&apos;s culinary scene continues to evolve in delicious ways. From culinary creations to quick bites by the creek; from catered picnics to fast food and from early morning coffee to late night snacks while listening to great music, Wimberley&apos;s dining options will please your palate. Stop by the visitor center, located at 14100 Ranch Road 12, when you arrive for local insight about things to do and places to see. Plan your Wimberley visit today at Wimberley.org. Photo courtesy of Clay E. Ewing.